80 business representatives gathered to celebrate local success at Moray Chamber of Commerce’s first annual award lunch. 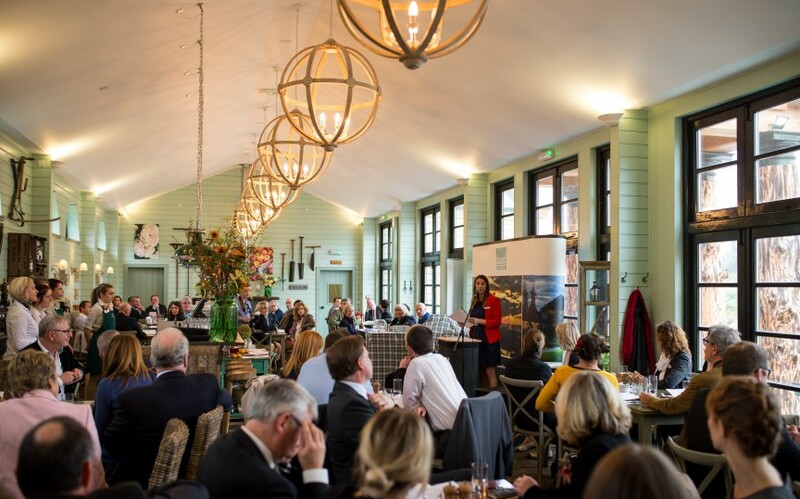 Held during Moray Business Week on Wednesday 4th November 2015 at Gordon Castle Walled Garden, guests were advised how these new awards were essential to compliment the business types in Moray. The first award of the day was the Most Promising Enterprise Award, sponsored by Business Gateway. The winner of this award was last year’s Highly Commended business at the annual awards dinner and the judges were delighted to see that Pinz Bowling Ltd had executed all of their plans for growth that they had included in their application in 2014 and then some. The second award, SME of the Year, is a significant award because Moray is 99% small and medium enterprises so an award to celebrate them is essential. Sponsored by Johnston Carmichael Chartered Accountants and Business Advisors, it was Pozzi Ltd who scooped up the first award of its kind. David Robertson, of Pozzi Ltd. has grown a Moray brand with a group of 5 companies after taking over his parent’s newsagent. You may be more familiar with the store names such as Bijou, Between Friends in Buckie and Bijou by the Sea. The next two awards are also the first of its kind and they celebrate Tourism in Moray & Speyside. 30% of our Moray’s businesses are tourism. With the launch of MoraySpeyside Tourism last year and with the worth of Tourism is on the rise, these awards were introduced. The MoraySpeyside Tourism Business Award was awarded to Gordon Castle Walled Garden. They attracted over 50,000 visitors in their first year to their Fochabers routes and they sell their high quality product range to all corners of the globe. They also work collaboratively with other businesses and in the local community. The final award of the day was the Community Tourism Award which was jointly sponsored by the Moray Economic Partnership & Highland and Islands Enterprise. The application process included the community groups explaining how they would spend the £500 prize money. Piping at Forres were this year’s winners and plan to spend their prize money on boosting their social media presence. The event attracts 18,000 spectators each year (almost double its original aim) and in turn they also contribute to the Moray economy. This year, the 3 year contract was unanimously extended by the Royal Scottish Pipe Band Association to take them to 2018. Guests enjoyed a two course lunch and heard from guest speaker Cally Russell, CEO of Mallzee. Cally turned down an investment from Dragon’s Den’s Peter Jones but has later signed a deal with Samsung for his web app that allows the user to browse hundreds of different brands in one place on their smartphone. Moray Chamber of Commerce is aiming to hold this event again, during Moray Business Week in 2016.